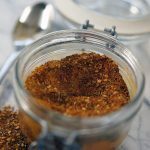 Easy and Tasty Chef's Blend Spice Rub Recipe takes only five minutes to make and stores easily in your pantry. It's simple to make and you can easily store it in your spice cabinet. It's delicious on pork, seafood, chicken or beef. So versatile and so flavorful! Add the sesame seeds to a dry skillet over medium/low heat. Shake frequently and toast the seeds until golden brown. When you smell them toasting - good chance they are done! Do not let them burn (turn black) remove from the skillet as soon as they are toasted as if you leave them in the skillet they will continue to cook. Combine the ingredients and mix together well. Store in an airtight container. For use on chicken, seafood, pork or beef. Enjoy!